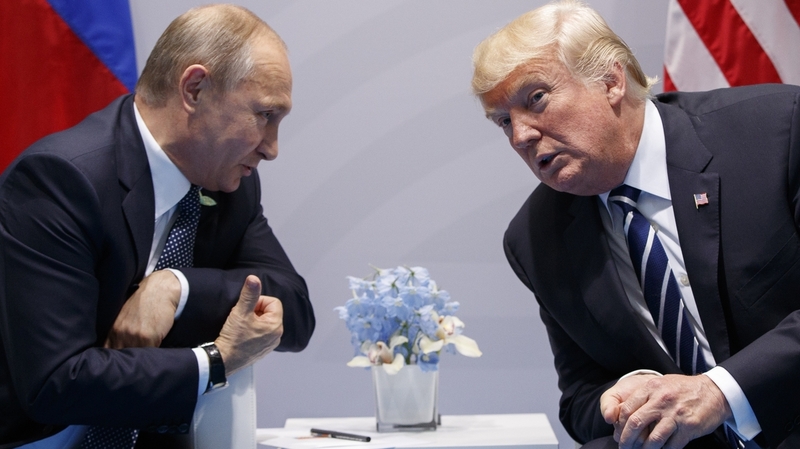 'Russian Roulette' Authors Seek To Connect The Dots Between Trump And Putin Journalists Michael Isikoff and David Corn have been at the forefront of the investigation of the Trump campaign's ties to Russia. Their new book attempts to put all the pieces of the story together. President Trump meets with Russian President Vladimir Putin at the G-20 Summit in Hamburg, Germany, last July. Isikoff was the first reporter to reveal that there was a U.S. intelligence investigation into Russian ties to a figure in the Trump campaign — Carter Page. Corn was the first to reveal the existence of the infamous Russia dossier, the unverified collection of reports alleging connections between the Trump campaign and Russia compiled by former British intelligence officer Christopher Steele. 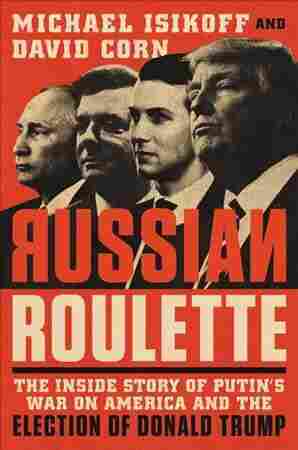 Now, in their new book, Russian Roulette, the two men attempt to put all the pieces of the story together. "We start the book with Donald Trump's trip to Moscow in 2013, when he really first forms this 'bromance' with Vladimir Putin," Isikoff says. Isikoff notes that Trump's 2013 trip to Russia for the Miss Universe pageant centered on a business deal: "He signed a letter of intent to build a Trump Tower in Moscow with a Putin-connected oligarch, Aras Agalarov." In 2016, Agalarov would later be one of the conduits for what was described to Donald Trump Jr. as an offer of help to the Trump campaign by the Russian government. The earlier potential deal for the Moscow Trump Tower fell through, Isikoff says, after the Obama administration and the European Union imposed sanctions on Russia following the annexation of Crimea and the invasion of Ukraine. But Corn says that the stalled deal may help explain other elements of the story: "People have been trying to figure out for years the positive remarks that Donald Trump has made about Vladimir Putin ... It's almost hiding in plain sight that one reason he has for saying all these kind things about Putin is that he was always interested in doing business deals there." Michael Isikoff: This is when he's presiding over the Miss Universe pageant. He goes to great lengths to try to get a meeting with Putin. It doesn't come through for a variety of interesting reasons, but he then wants to tell the world that he met with Putin anyway, and he actually repeatedly does, even though he didn't. But you can see the seeds of the Trump-Putin relationship in that trip. And what was it all about? It was all about a business deal. He signed a letter of intent to build a Trump Tower in Moscow with a Putin-connected oligarch, Aras Agalarov, and it was something that was a very high priority for him and had been for many years. Isikoff: In February 2014, Ivanka Trump travels to Moscow to scout potential sites for the Trump Tower with Emin Agalarov and the project doesn't ultimately go through. Why? ... One development that may well have played a big factor ... was ... this is right at the time Putin has annexed Crimea, invaded Ukraine, stiff sanctions are put on by the Obama administration and the European Union, including Sberbank, the bank that was going to finance the [Trump Tower] operation. And Rob Goldstone, who is quoted in the book — and this is, I believe, the first interview he's given to anybody about these developments — says he believes that it was the imposition of sanctions that killed the deal and that this may well have influenced Trump's view of sanctions and his advocacy later on, during the presidential campaign, of lifting sanctions on Russia. David Corn: Sberbank is majority-owned by the Russian state, by the Russian government. Which means that Trump was trying to enter into a deal that involved the Russian government. And, of course, no major projects can take place in Moscow — and this is a deal worth billions of dollars — without the approval of the government. And who runs the government? Vladimir Putin. Corn: [Trump's circle] had reason to believe more than anybody else that there was a Russian effort to help and to boost Trump. They knew that members of their own campaign — people like George Papadopoulos and Carter Page — were making connections with Russian officials and Russian cutouts. And Trump was even briefed in mid-August 2016 when he was a candidate about the Russian hacking of the election and still after that continued to say it wasn't happening ... Again and again and again, Trump and his defenders say that there was no contact with Russia, "We did nothing wrong." Put that all together with a little bit of distance and you see how the Trump campaign and Trump himself almost in a way aided and abetted what the Russians were doing by continually denying that they had any role in the election and making it difficult for the United States and the Obama administration to forge a bipartisan response to what was happening. Corn: His name was Gen. [Valery] Gerasimov, and this came out in an obscure military journal in early 2013 and no one paid much attention to it until a translation appeared a few months later. He basically said, listen, the war of the future will not be played out in real space. It won't be between battalions and fleet of aircraft and fighter jets, it's going to come about through other means. It was pretty stunning to see it in retrospect — [he] talked about how to take advantage of the divisions within your enemy. If you look at what happened in 2016 with the social media campaign and with the hacks and dumps that the Russians pulled off, what they did was exploit existing sometimes very bitter divisions within America. They did it on Facebook, they did it on Twitter, they figured out how to turn Bernie Sanders supporters against Hillary Clinton, they really took advantage of some of the political conflict and strife that we're ultimately responsible for in the United States, but that was one of the things that the general pointed to that could be weaponized, and they did so quite well, I think, in 2016. Sam Briger and Thea Chaloner produced and edited this interview for broadcast. Bridget Bentz, Molly Seavy-Nesper and Philip Ewing adapted it for the Web.